What do you do when the attic, basement, and closets are full of “treasures” that you have been collecting over the years? Open a store and begin selling it all! The combination of lots of storage space and a yen to collect things different and unusual is fraught with danger. Spaces quickly fill up and items get forgotten. I live in an 1840 converted barn with a huge hayloft and full basement. When we moved in three years ago, the empty spaces seemed cavernous. Now it is a struggle to pass through the hayloft and basement. The time had come to make some hard decisions about what to keep and what to jettison. The Cambridge Antique Market provided the solution. It is a multi dealer space and had a vacancy. Serendipity! 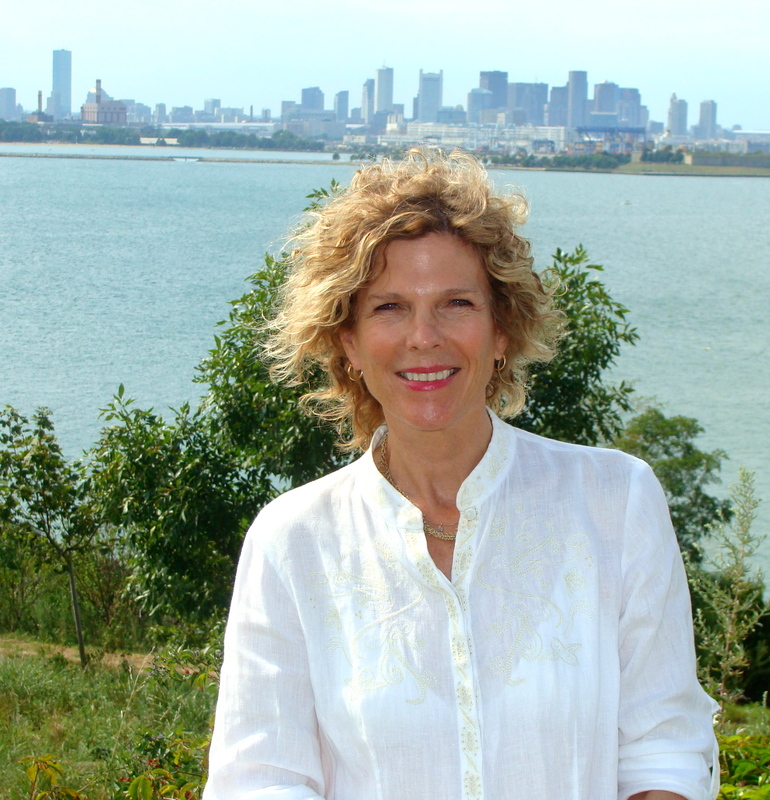 Susan, a close friend, had recently transitioned out of a position at an antique shop on Beacon Hill and was looking for her next business venture. She had previously managed a gallery in Palm Springs, California which held an amazing variety of vintage and antique objects. While working there she became conversant with collectible mid-century modern pieces and developed an unerring design eye. 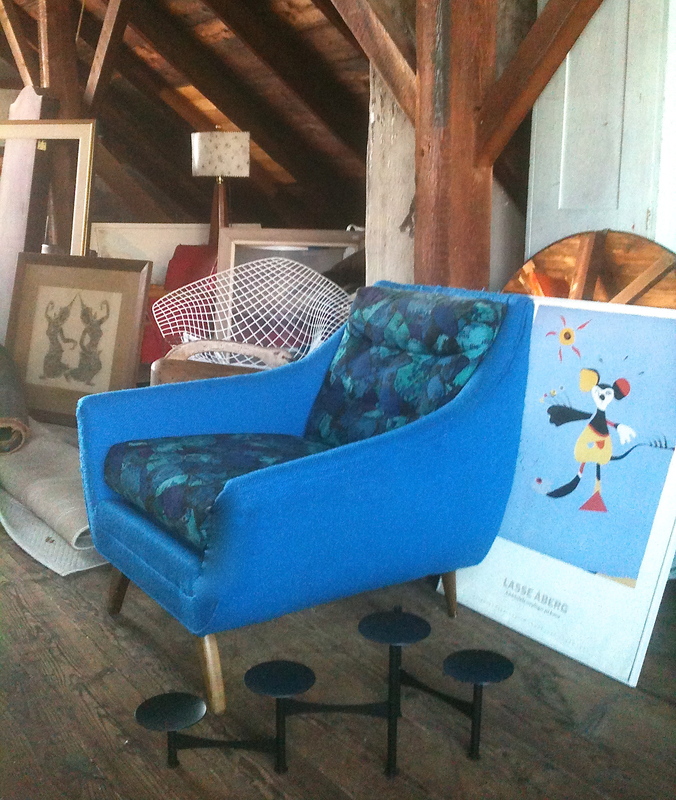 I grew up with a houseful of 1960s Danish modern furniture and all the attendant household goods that fit that design. A perfect marriage of acquired knowledge and past experience. The 1950s through 1970s were a hopeful and optimistic time in America. The outlook is reflected in the design of the architecture, furniture and household items of the time. A new generation of twenty and thirty year olds is discovering the period’s upbeat mood and style. The TV show Madmen, which captures the era so deliciously with its mid-century modern set design and clothes, has helped fuel the renewed interest in the time and its design. 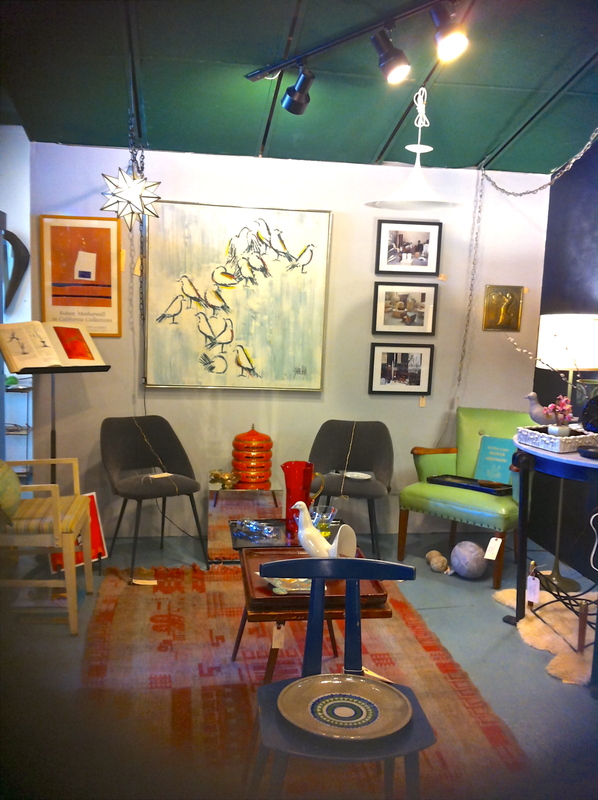 An idea for a market niche for our space at the Cambridge Antique Market was hatched! Since setting up shop there, our space was shown in several shots of a segment of the Boston area TV lifestyle show, Chronicle. The Boston Globe also recently sent a reporter to write an upcoming piece on the Cambridge Antique Market. When the reporter asked Michelle, a knowledgeable long time staff member, what was currently “hot,” Michelle ushered them to our space. 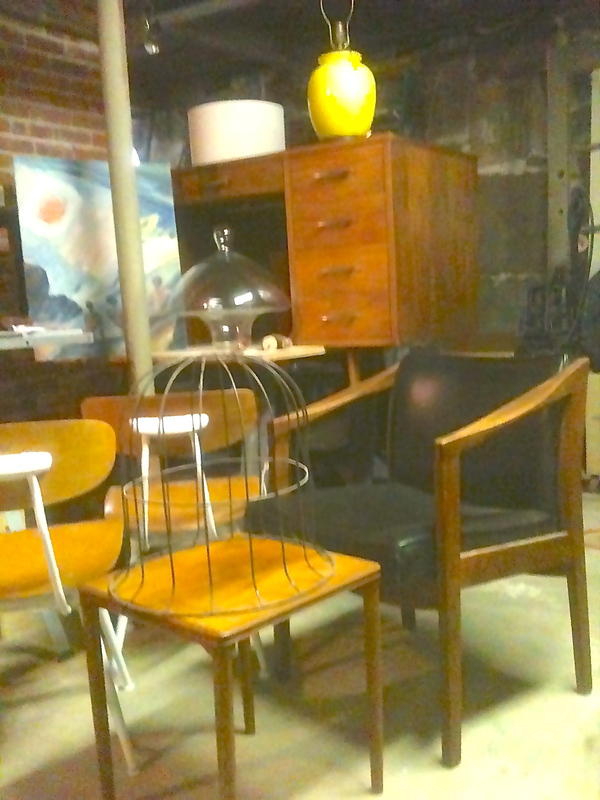 Last week, set designers from a movie being shot in Boston came looking for mid-century modern items and found our treasure trove. Our space is hopefully becoming discovered. I wish I could say my hayloft and basement were bare once again, but in fact my collecting has just gone into hyperdrive. While the space is no less crowded, the items are constantly changing. 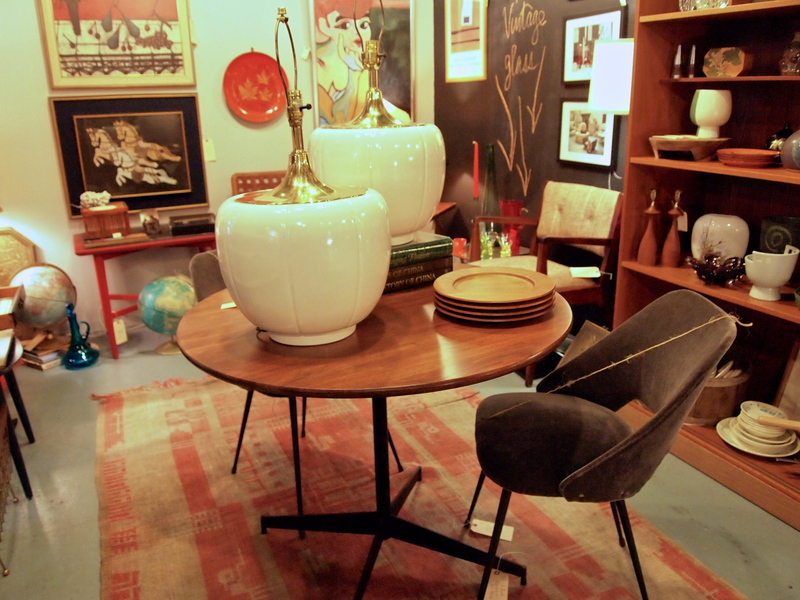 Susan and I have a full press hunt on for mid-century modern and other unusual treasures. We need warehousing space. It feels a bit like rearranging deck chairs on the Titanic. 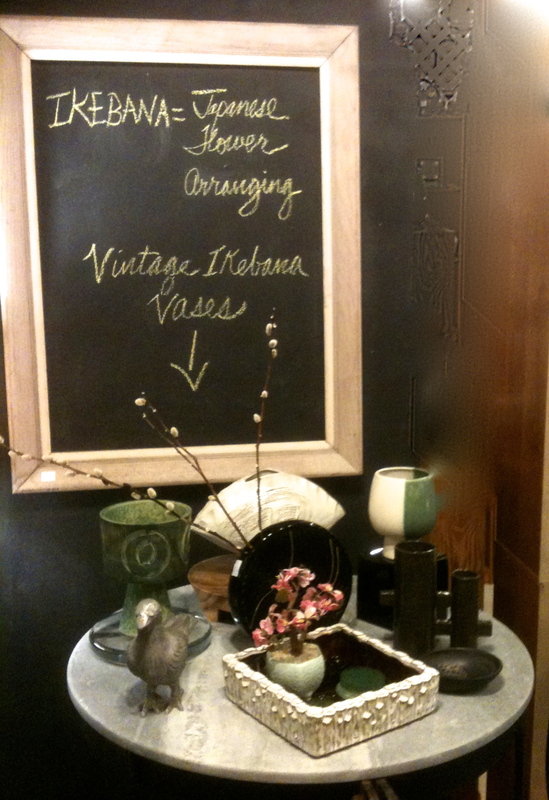 Susan and my “finds” can be seen at The Cambridge Antique Market, 201 Msgr. O’Brien Highway, Cambridge, Massachusetts. Space 274/275 is on the second floor. Great article. Congratulations on your success with this exciting venture. Looks fantastic! Congratulations and your readers are psyched (even if you are more ambivalent) to know that your acquiring has gone into hyperdrive — more great stuff for us to see on your blog (and in your shop space). As you well know from having a retail store, the hunt for the new and different takes on a life of its own! Hey! I recognize those dancing dervishes in your attic treasures photo. Where did you find them? A new day, a new chapter – best wishes for success in your new endeavor. They are charcoal rubbings from a temple in Thailand. 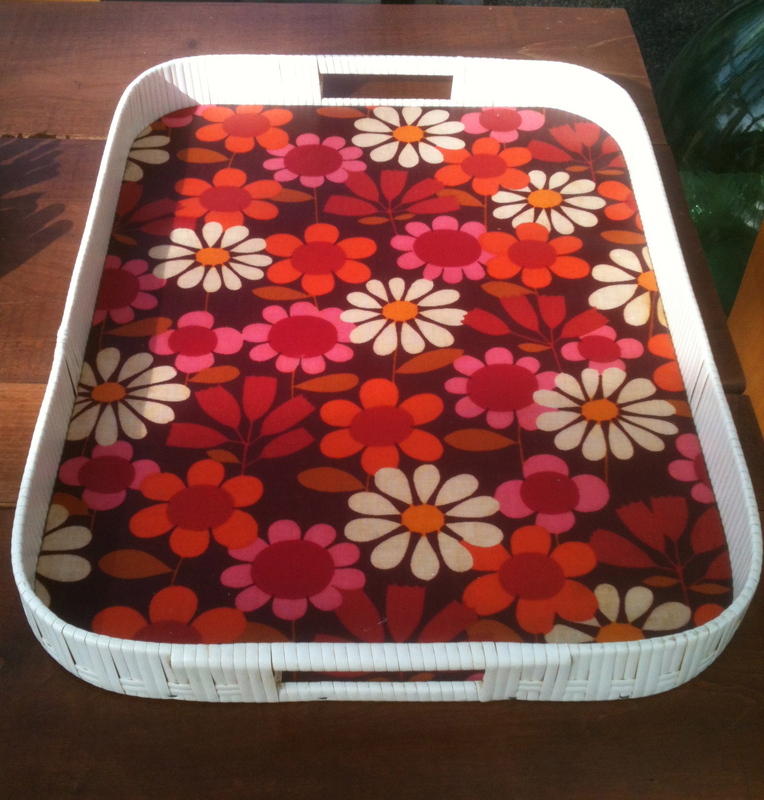 These were popular in the 1960s for interior decor. It is now forbidden to make any new rubbings as the figures were being worn down. They do capture an era, don’t they? The fascination with all things Asian from that period.